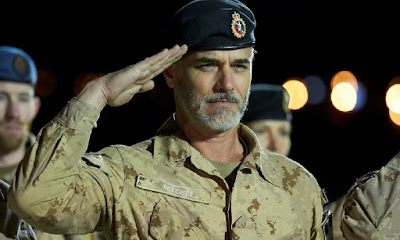 A full trailer is out for Paul Gross’s Hyena Road and it looks intense! Elevation Pictures released the trailer today for the upcoming Afghanistan-set/Jordan-shot drama starring Gross, Rossif Sutherland, Clark Johnson, Allan Hawco and Christine Horne. The film looks very impressive, both for its scope and production, and is one of the Canadian films previously reported by Screen to be circling the opening night slot for the Toronto International Film Festival. (The others are Atom Egoyan’s Remember and Deepa Mehta’s Beeba Boys.) Gross previously opened the 2008 fest with Passchendaele, but Hyena Road will probably be one of the bigger Canadian productions of the year regardless of where it lands at the fest. The film opens in theatres October 9. Synopsis: Three different men, three different worlds, three different wars - all stand at the intersection of modern warfare - a murky world of fluid morality where all is not as it seems.